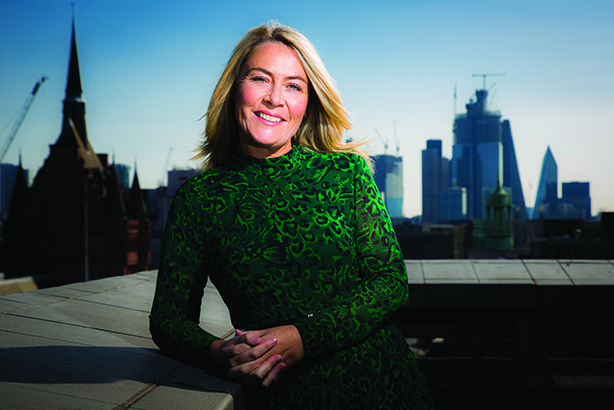 The agency's CEO, Sarah Scholefield, tells PRWeek how she has led the programme of transformation that has helped to pull the agency back to profit after the turmoil of recent years. Meeting Sarah Scholefield at the pristine Grayling HQ in London’s Holborn Gate, it does not seem like an agency that has been through the mill in recent years. The office is serene, but the UK CEO is buzzing as we talk through changes made under her watch and plans for the future. Not long ago the sick boy of the large agency world, in financial terms, sliding revenue and profit was the norm for Grayling during much of this decade. In 2014/2015, turmoil at parent company Huntsworth culminated in the exit of founder/CEO Lord Chadlington, chairman Lord Myners and Grayling CEO Pete Pedersen. Against this backdrop, Scholefield joined Grayling in 2014; around the same time as Huntsworth CEO Paul Taaffe. Shortly after his appointment, Taaffe told PRWeek he saw the group’s woes as primarily structural and operational, rather than due to fundamental problems with the agencies. This chimes with Scholefield’s response when asked of her first impressions of Grayling then. "Grayling is, and was, a very solid agency. It suffered by hiding its light under a bushel… the quality of the work was still really good. There seemed to be a slight lack of confidence and a lack of ability to really demonstrate innovation and dynamism and positive momentum." The agency needed "a fresh approach," she says, and the new leadership opened up slightly different ways of doing things. "It was in a strong position, but just needed an injection of energy and refreshment." She has a point. Despite the financial woes, this was an agency with a global network that still commanded the respect of some big-name clients. Hilton, Fujitsu, PayPal and, until recently, British Airways have been on Grayling’s books for many years. Even after a restructure and multiple office closures, it boasted a global revenue of $52.2m in 2017, with more than 500 employees. UK revenue last year was £9.7m – down from £10.9m in 2016 – although Taaffe told PRWeek this summer that the UK agency was "on fire", growing at "high single digits". Crucially the UK business was the first to return to profit in early 2017. Scholefield’s priorities, she suggests, have been to loosen restrictions on employees and change the offer where required. On her arrival, the structure was "complicated" and in need of simplification, and the CEO stresses the need to "mould ourselves around the client need"; a common ambition for agencies, but, perhaps more contentiously, she adds: "It’s not about integration, [which] often feels like putting two things together that don’t necessarily want to be together – it can be the outcome of a merger, or whatever. "But where you’ve got to, and this has happened very organically, is a sort of blending of services across the business." In practice, this has meant assigning staff from the different specialisms – corporate, consumer and public affairs – to a client based on their needs. The broad revenue split is 45 per cent corporate, 35 per cent public affairs and 25 per cent consumer. But it is "disingenuous", Scholefield argues, to try to fit Grayling into those silos. "Let’s put the team together, a blended team, that’s going to be able to solve the problem for the client rather than saying: ‘It’s a corporate brief, it’s a consumer brief.’"
Practical changes have included halving the size of the executive board. "[It] needs to set the strategic direction of the business and lead by example," she states. "But what it isn’t is a committee." Merging Atomic, Huntsworth’s consumer shop, into Grayling in December 2015 was another big change. Grayling’s consumer offer "needed a shot in the arm", says Scholefield. "We used to be very strong there, before my time, and I felt it lacked a bit of direction." Grayling has also assembled an advisory panel, whose members include former Sunday Times news editor Stephen Bevan and former MP Angie Bray. One can see why Scholefield’s experience across different sectors and geographies made her an obvious choice to lead the changes. Entering the industry as a receptionist at financial PR firm Haggie Bins in the early 1990s, her first ‘proper’ PR role was as a junior press officer at now-defunct London cable news station Channel One, which included some presenting work ("It wasn’t my comfort zone"). Like so many agency bosses, a stint at Freuds followed; she rose to lead a brands team that worked on KFC, Nike and Jack Daniel’s. In subsequent years she and her husband moved back and fourth between Singapore and the UK, during which time Scholefield cut her teeth in corporate, b2b and healthcare comms at Edelman and later Fleishman Hillard. At the latter she oversaw Asia Pacific, central Europe and East Africa, working on the Visa account. 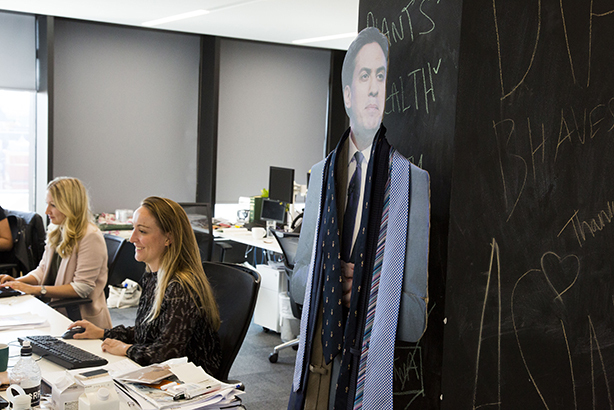 Moving back permanently to the UK, Scholefield saw a job advertised – a global CRM role for a global agency. The client was PayPal, the agency Grayling. She later became its head of corporate in the UK, then UK MD, and ultimately UK CEO in 2017. Not surprisingly, given the aforementioned turmoil, redundancies were inevitable. While Scholefield does not reveal numbers, in 2017 the UK head count stood at 117 – down from 206 in 2015. She is fairly blunt on the issue. "We made a lot of change. If you shake a tree, apples will fall, to be honest. "You have to reflect the changing needs to the clients, and unfortunately what goes with that is some restructuring. It’s difficult, without a doubt; but equally, I think we’ve emerged from that period retaining the best of what Grayling was – in terms of the quality of the work and the quality of the staff – but also by attracting a whole new raft of different people to the business and producing different sorts of client work. "It has been a transformation, but we haven’t completely walked away from where we were, because there have been some really solid briefs there. This is about natural evolution." Scholefield says the redundancies were made "across the board", but have coincided with appointments to new roles that best suit her vision for the business. These have included a business development director and central function roles to assist the creative specialists. "It’s about saying: ‘What do you need to make the business flourish?’"
She adds: "We’ve been very successful in that we’ve retained most of our big clients; probably bar British Airways [which moved to Ogilvy and Hill+Knowlton as part of a WPP group offer this year] – that wasn’t a result of the changes we’ve made, [but] more down to the changes they made. "A lot of our big clients, our long-standing clients, trust us, so consequently did stay with us and are still with us now. But you want to make sure you’re still attracting new clients, and part of this renewed energy we have in the business… is people are starting to reconsider us in a way that perhaps they weren’t." More recent client additions include Visa, IT group Amadeus, and betting firm Betstart. Did the return to profit feel like a breakthrough moment? Scholefield is cautious, pointing to other factors such as paying double rent for a period when it had two offices. 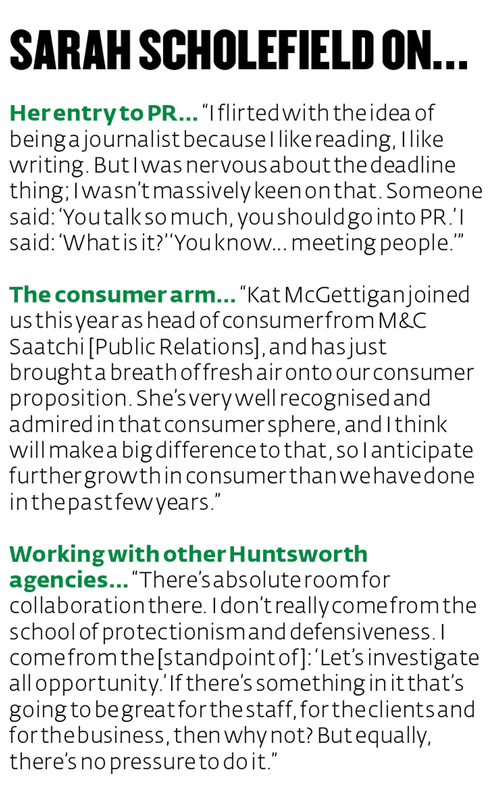 As Taaffe told PRWeek earlier this year, Huntsworth agencies have been parting from "unprofitable" client accounts. Questioned about the impact of this approach, Scholefield responds: "Has it affected the UK? Possibly." Either way, a return to profit is a welcome sign that "things are going the way they should". Looking ahead, the idea of new offices is "under constant review" after openings in Manchester and more recently Glasgow. Other plans include launching a stakeholder risk-assessment service and building the agency’s design capabilities. "That’s work in progress," she says. More broadly, returning to the top 20 of the PRWeek UK Top 150 Consultancies table is another goal. A quick return seems unlikely – at 29th, Grayling trailed 20th-placed MHP by more than £8m in revenue for the calendar year 2017. Nonetheless, Scholefield signals that she won’t make changes just for the sake of it. "Natural evolution" remains her mantra. "I don’t want Grayling to be one of those agencies that’s adopting everything; it has to be right for our business and clients," she explains. "I watch with interest what other people are doing but it all has to be put through the filter of your own culture and organisation, about where you expand. "I’m very open to new things, doing things differently and encouraging everyone in the business to do the same. But obviously we need to do it at our own pace."